Eighty years ago, in 1938, the city of Munich saw the signing of an agreement on the partition of Czechoslovakia which became a prelude to the Second World War. Later, in the course of the Nuremberg Trials, the leaders of the Third Reich tried to justify the Munich conspiracy by claiming that its aim was “to push Russia out of Europe”. For instance, this is what Field Marshal Wilhelm Keitel said. The Munich tragedy highlighted the main sensitive points of that period, including belief in one’s uniqueness, lack of unity and mutual suspicion, reliance on “sanitary cordons” and buffer zones, as well as open interference in the internal affairs of other countries. These memories are particularly alarming when compared to modern realities, underhanded attempts to distort the historical truth about World War II and the events preceding it, as well as to rehabilitate Nazis and their accomplices. Some EU countries have laws equating Nazis and their accomplices with those who liberated Europe and allow the demolition of monuments to those who defeated Nazism. The experience of World War II and the subsequent split of the continent during the age of bipolar confrontation should have convinced European nations that there is no alternative to building a common European home where people will not be divided into “us” and “them.” The very integration project of the European Union is rooted in a desire of the founding fathers to prevent the revival of the logic of confrontation which was the reason behind many disasters on the continent. For many years after the fall of the Berlin Wall and the reunification of Germany, in which Russia played a crucial role, we did our best to build an architecture of equal and indivisible security in the Euro-Atlantic region. We decreased our military capability on our western borders dramatically. We persistently advocated for strengthening of common European institutions, primarily the OSCE, and for harmonisation of an international legal framework regarding European security. To out regret, our calls for an equal dialogue and implementing the principle of indivisible security fell on deaf ears. Contrary to the promises made to us in the 1990s, as documents published by the US National Archives have recently confirmed again, NATO continues its eastward expansion. NATO troops and military infrastructure are accumulating on our borders. NATO continues its gradual military build-up in Europe. The implementation of US missile defence plans in Europe is undermining strategic stability. Targeted propaganda campaigns are underway to engender hostility against Russia among the Western public. The establishment of many countries has almost coined a new rule of political correctness: talking about Russia say either bad things or nothing. When people in the West speak about Russia’s growing influence, they mostly do so in a negative way. The authors of a report prepared for this conference followed this precise approach. 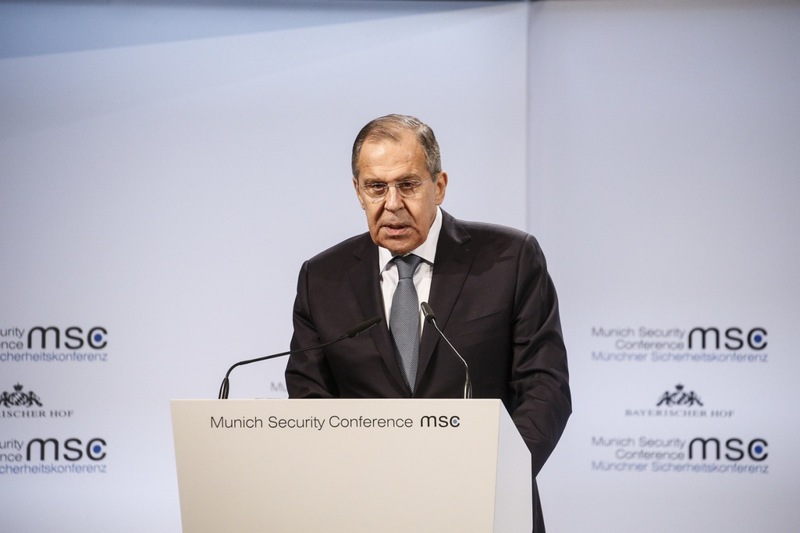 I would like to remind you that when Russia was weakened and went through the period of historic challenges, everyone said that they wanted Russia to be strong and that any actions taken by countries outside the region in Russia’s neighbourhood and not only there are not directed against our interests. They gave us similar promises regarding the EU Eastern Partnership project. We hope they will be fulfilled and that Brussels will cut short any attempts to transform this project into a Russophobic one. It is extremely dangerous to consider the situation in Europe as a zero-sum game. And we see one of the consequences with our own eyes, it is Ukraine affected by an internal conflict which, by the way, in the context of working on the Association Agreement with the EU, had to face a false choice – either to be with the West, or with Russia. It is regrettable that the EU, which subsequently agreed to act as guarantor of the agreement of 21 February 2014 between the Ukrainian Government and the opposition, proved unable to ensure its implementation and actually supported the anti-constitutional coup. And now Ukraine, a country with huge potential and talented people, has been plunged into such a situation that it is not able to govern itself. Russia has a greater interest in the settlement of the internal Ukrainian crisis than anyone else. We have the legal framework for this – the Minsk Package of Measures, which was drafted by Russia, Germany, Ukraine and France with Donetsk and Lugansk and approved by the UN Security Council. This agreement must be strictly implemented. However, for now Kiev is openly sabotaging the relevant efforts in the Contact Group and within the framework of the Normandy format. Moreover, Kiev authorities started talking about a military scenario. I am sure that the EU is well aware of the dangers of this development. To out regret, fresh attempts are being made to force the countries of Russian and the EU common neighbourhood, be they in the CIS or the Balkans, to choose between the West and the East. The German newspaper Die Welt has recently published an article titled “The EU or Putin: Who Gets the Western Balkans?” [EU oder Putin – wer bekommt den Westbalkan]. And this is far from the only example of public indoctrination in keeping with the “us or them” philosophy. Rejecting collective Russia-EU cooperation mechanisms, such as summits, the Permanent Partnership Council and sectoral dialogues, and opting for pressure mechanisms have not made our continent a safer place. On the contrary, the conflict potential is visibly increasing in Europe, the number of problems and crises is growing within Europe and on its borders. The developments in the Middle East and North Africa have shown that the policy imposed from across the ocean aiming at replacing undesirable regimes and instilling alien development models does not only create chaos in broad regions but also strikes back with import of real threats to Europe, primarily a spike in international terrorism, huge waves of illegal migration and all other related issues. In order to understand the genesis of the current relations between Russia and the European Union one should take all the mentioned-above into account. Russian authorities invested hard work and political capital in developing mutually beneficial relations with the EU. But the goal of developing a truly strategic partnership, a reliable and stable system of relations which would guarantee increasing competitiveness both of Russia and the EU has not been attained. And it is not our fault. I believe that the EU has been unable to find the golden mean in relations with Russia over the past decades. In the 1990s, there dominated a concept that Russia was a disciple who should be consistently tutored according to Western standards regardless of its objections. The predominant myth now is the alleged “omnipotent Russian threat,” they are trying to find its traces everywhere from Brexit to the Catalan referendum. Both stereotypes are profoundly mistaken and point to the lack of common sense and understanding of Russia. We note that more and more people in the EU feel uncomfortable about the abnormal situation in our relations. Prominent experts openly admit that “diplomatic paralysis” is the price they have to pay for demonstrations of illusory EU unity on the Russian track. Russia has not changed its policy approaches to cooperation with the EU. We would like to see the EU united on the basis of fundamental interests of its member states. They should be free to determine the ways to develop their economies and foreign economic relations, for example, the ways to meet their energy needs – either proceeding from pragmatic, commercial approaches or acting under the influence of political and ideological considerations. We proceed from the assumption that the EU can play an active, responsible and, let me stress it, independent role in international affairs. I have taken note of Ambassador Wolfgang Ischinger’s interview with the Bild newspaper, in which the respected Chairman of the Munich Security Conference speaks about the need for the EU’s higher foreign policy profile. We welcome his idea that Russia, the EU, the US and China should work together to create a security architecture on the Middle East. A similar approach may be applied as well to the Gulf. It is in Russia’s interests to have a strong and predictable European Union for a neighbour, an EU that would be able to act as a responsible member of international life in the multipolar world the emergence of which we may see with our own eyes. It is time to stop trying to act against the natural course of history and to start working together to renew the system of international relations proceding from an equitable basis and the central coordinating role of the UN, as enshrined in its Charter. Russia is open to an equal partnership with the EU based on mutual respect and a balance of interests aiming at addressing efficiently the challenges of today. We are ready to develop our relations with the United States and all other countries applying the same principles. It is important to make good use of the potential of Russia-EU cooperation so as to create a common space of peace, equal and indivisible security and mutually beneficial cooperation in the area from the Atlantic to the Pacific Ocean. At the strategic level, I would like to draw your attention to the initiative of President Vladimir Putin on promoting a greater Eurasian project that would combine the efforts of members of the integration structures within the CIS, the SCO and ASEAN. I see no reason why the EU could not join this initiative starting, for example, with establishing professional contacts with the EAEU. I hope this day will come soon.